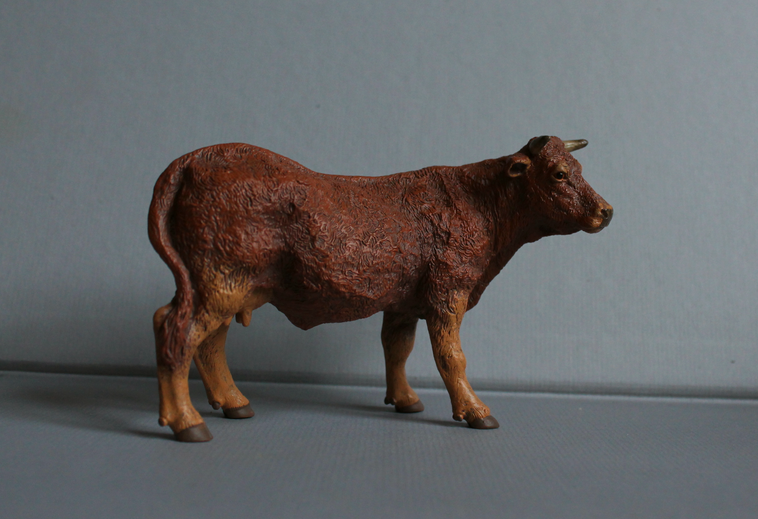 2016 Kouprey bull (Bos sauveli) resin by Noémi D. Soos Creations. 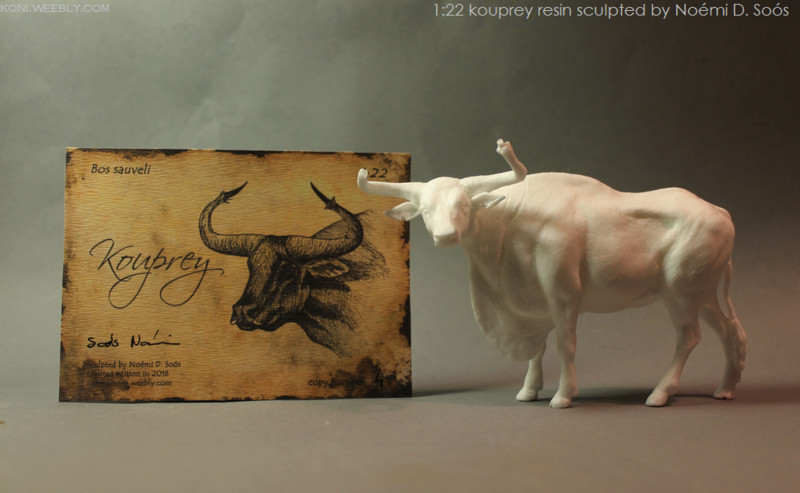 Painted and mohaired into a young kouprey bull only starting to grey out. The species was known to have horn sheaths which frayed and chipped away at the tips as the horns grew. I tried to imitate the effect on the model with minuscule hanks of twisted mohair made rigid with glue. 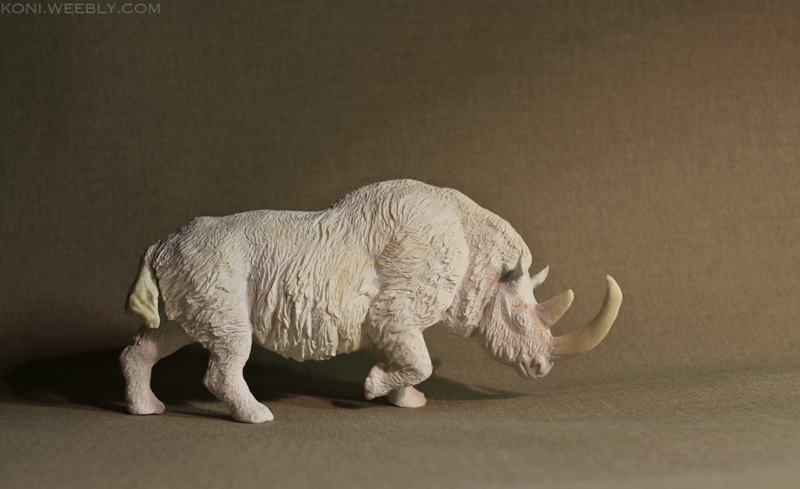 Signatu Studio woolly rhinoceros bull (Coelodonta antiquitatis) resin sculpted by J Miguel Aparicio, slightly resculpted by Aleksander Freda of Dark Pegasus Studio (he sculpted the rhino a new tail) and me (repositioned the nasal horn). Painted by me in 2018. More pictures of this one can be viewed in my personal collection. 1:20. Bombel Woda, a Brigitte Eberl Ulan resin with a resculpted face, hooves and undecarriage, painted & mohaired to a black varnish appaloosa Polish halfblood. 1:10. 2018 work. ​Further pictures of the model & information about the tack shown can be found in my personal collection. Some of the below pictures were taken by Aleksander Freda of Dark Pegasus Studios, who also advised me on the model's painting. Thank you Sasha! Papo 2010 Limousine cow 51131 resculpted and painted into a Salers. The bell is by me, too. Aleksander Freda of Dark Pegasus Studio took most of the pictures shown. 1:22. 2018. Lineol American elk (Alces alces), 3rd or 4th generation (from either 1930 - 50 or 1950 - 65), restored by Aleksander Freda of Dark Pegasus Studio; resculpted and repainted by me to a post-rut bull. About 1:20. 2017. ​Pictures in Autumnal Finnish Lapland by Dark Pegasus Studio. Thank you Aleksander!